In recent decades, Hyaluronic acid (HA) has been used as a new polymer in drug delivery – a system that combines traditional drug delivery methods with engineered technology to specifically target where a drug is released in the body and/or the rate at which it gets released. HA was chosen since it has good biocompatibility, biodegradability, and high viscoelasticity, and can be combined with a specific receptor on the cell surface. One of our customers faced a problem, macromolecule active ingredients (or at least 500KD) are historically difficult or impossible to deliver topically through tissue structures with the limitation of traditional methods. The customer is a clinical-stage bio development company whose objective is to reduce society’s exposure to potentially harmful active agents by utilizing novel permeation technology to deliver active agents through tissue structures more efficiently. “The topical delivery of large molecules through skin, hair, eyes, mucosal surfaces and bone are difficult using traditional hyaluronic acid.” said a medical director from one of our customers. 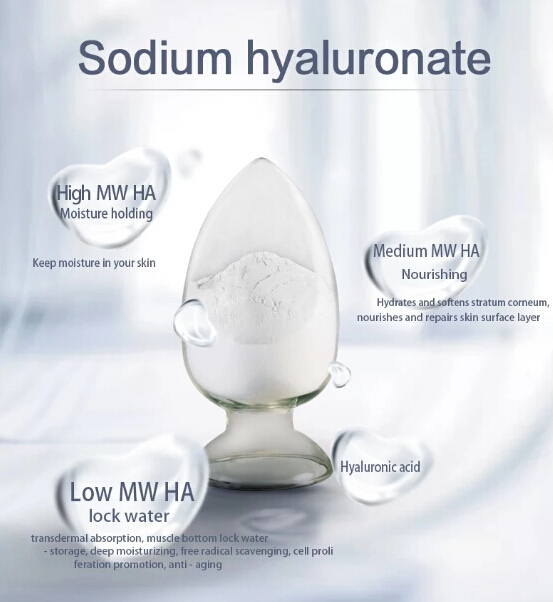 In the past, the most common form of hyaluronic acid in the pharmaceutical industry is high molecular weight HA, usually, more than 1800 K Da. The difference between high-molecular hyaluronic acid (≥1,800 kDa) and low-molecular-weight HA (10 kDa ~1,000 kDa) is that the low-molecular-weight HA has been split into smaller fragments. The smaller fragments can no longer form a gel with water like the large molecules, but they can penetrate the skin much easier and have a better anti-irritant and regenerating effect once absorbed by the skin. In the past, the customer had purchased traditional mini HA (>10K Da) for its pharmaceutical delivery research. Over the years, Stanford Chemicals has developed HA with the low molecule that has stronger skin penetration, named micro hyaluronic acid (micro HA), is a low molecular weight HA (<5K Da). It is even lower than the mini HA. The main functions of Micro HA are recovery and super moisturizing the tissues. Stanford Chemical’s Micro-HA Super Active hyaluronic acid was used in Illustris molecule delivery technology to help facilitate a permeation process of the drugs in the human body. 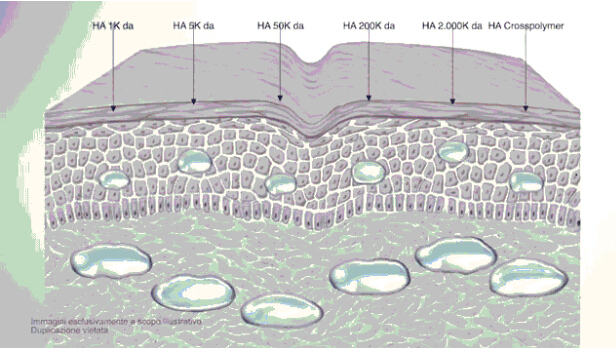 Micro hyaluronic acid as drug carriers contributes to drug thickening, sustained release, transdermal absorption, and improved drug targeting. By adopting the low molecular weight HA, the customer is able to provide a significant competitive advantage to molecule delivery, yielding enhanced safety and efficacy for patients. Since 5 kDa HA revealed a much more pronounced absorption activity through the skin than it could be observed for 10 kDa HA. Due to its micro size, micro-HA super active hyaluronic acid penetrates deep into the skin and other tissue structures easily, optimizing the absorption of compounds delivered through skin, eyes and mucosal. With the addition of micro HA, the cell proliferation rate of macromolecule active ingredients increased significantly; 0.125% microHA can make the cell proliferation rate increase up to 94%. The customer enables the delivery through tissue structures of macromolecule active ingredients (or at least 500KD) which are historically difficult or impossible to deliver topically and optimizes delivery of active agents which previously permeated tissue structures inefficiently. It is easy for active ingredients to permeate the targeted site with Micro HA. Now, it enables the delivery of large molecules (up to 160KD) through tissue structures easily and optimizes the absorption of compounds typically delivered through skin, eyes and mucosal surfaces. Stanford Chemicals (SCC) supplies high purity micro HA at a very competitive price. Since the advanced specification of micro-HA, our customer can research its innovative delivery technology for pharmaceuticals easily. Therefore, this is a win-win result, it is also good news for HA market. We are both happy with this transaction. There are several benefits to using SCC micro HA throughout the pharmaceutical delivery process. For pharmaceutical companies with similar applications, our engineering team can provide a customized solution for your project. Feel free to contact us at sales@stanfordchem.com.